To work on any road in Queensland or New South Wales the appropriate permit must be obtained before you can begin work. Let our team of experts help you on your way to get up and running. Essential for roadworks, a Traffic Guidance Scheme (‘TGS’) plans the movement of vehicles and pedestrians around a worksite. When preparing your Traffic Guidance Schemes and Traffic Management Plans, our team will ensure safety for both your site and the general public. 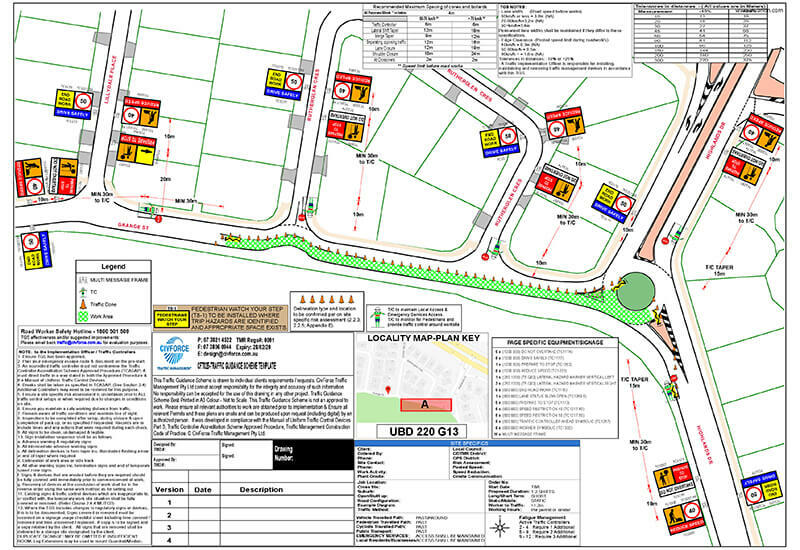 All TGS’s produced by Civforce are quality documents that are site-specific and drawn with attention to detail. From preparing Traffic Management Plans, drafting site specific Traffic Guidance Schemes on RapidPlan, to obtaining council and police permits, our design studio will be sure to satisfy your traffic requirements.